United Patients Group is globally recognized as a trusted leader in medical cannabis education (CEU) and guidance. Medical Institutions, Physicians, Nurses, Pharmacy Industry and Local, State and International Governments all look to UPG for referrals to ethical and trusted organizations to better serve their patients. If you are a product company and are committed to Quality, Safety, Ethics, Consistency, Accountability and Transparency, apply here. It is our honor to recognize Product companies who are holding themselves accountable and are ready to take on this challenge. The UPG Seal of Approval is available to a full spectrum of professionals and products in the medicinal cannabis field. By applying for the UPG Seal you are showing your customers that you are committed to Standards, Ethics and Safety. 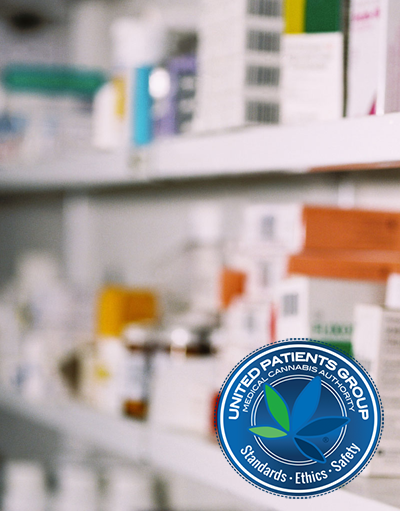 The United Patients Group Seal of Approval creates confidence and continuity in the cannabis industry. The products and companies that bear the Seal, have committed themselves to the highest level of integrity, ethics and best practices. Those that have earned this Seal become part of a movement to elevate trust within the industry as well as the states that have created a cannabis system for their constituents. If you see a United Patients Group Seal on websites, apps, products, or the front door of an organization, one can trust that said company has been vetted to a rigorous standard of compliance. If you would like to be considered for our Seal of Approval or would like to submit a product or organization, please click the button below to start the approval process. Please read our overview of the program and faq’s before starting. After reviewing, if you have questions, please contact our client services team.